Wrightslaw special education law and advocacy training programs are designed to meet the needs of parents, advocates, attorneys, educators, health care providers, and others who represent the interests of children with disabilities and their families. Private Training - In addition to the above programs, Wrightslaw provides private training for agencies, organizations, private schools, clinics, etc. These programs are designed to meet the specific needs of the members and, at the discretion of the hosting organization/agency, may be closed to the public. Hybrid Programs - Pete Wright can create a hybrid program that is specific to the needs of your organization and may include a mix of some of the programs below. For example, Pete trained all of the Juvenile Probation Officers and some of Juvenile Court Judges in one state. In another program, Pete created a two-day training session specific to the needs of Children's Hospital staff who focus on Brain Tumors and problems caused by chemo and other treatment regimens. The first day was for hospital school liaison / social work staff. The second day was for the parents and other related service providers. With other programs, Pete trained selected State Department of Education staff about the protocol for conducting randomized case audits of LEA student files. Pete trained the Administrative Law Judges of an East Coast state with a focus on Court of Appeals case law. Pete trained the Protection and Advocacy (NDRN) staff of a West Coast state. After the new version of the DSM-5 was issued, a "hybrid" program was related to changes in the DSM-5 about autism and dyslexia. In Summer 2014, Pete did a specialized day long program in NYC for charter school administrators, charter school special educators, and parents of children enrolled in charter schools with regard to unique special ed / charter school issues. Two weeks later, at FARE's National Annual Conference, Pete did a day long program specific to issues relating to allergies and anaphylaxis. Many children with such issues may not qualify for an IEP, but because of the "episodic" nature of such issues, qualify for protections under the Americans with Disabilities Act and are entitled to a Section 504 Plan. Thus this program included a comprehensive discussion about those statutes and case law and only an overview of IDEA 2004. "Hybrid" programs have focused on specific legal issues and also specific to a disability. To inquire about hosting a program, please send an email direct to Pete Wright at the following email address of: petewright | at | harborhouselaw.com (Note - remove the |at| and replace with the @ character.) In the subject line of your email, please type your state and city in ALL CAPS. For example: CONF VA DELTAVILLE - initial inquiry. Presenters: Wayne Steedman, Esq. or Pete Wright, Esq. "What a marvelous conference! I often leave sped presentations angry and/or guilty because of all the things that were done or not done. This time I left encouraged, inspired and armed!" In From Emotions to Advocacy training programs (one day, 6 hours), you learn how to take an active role in managing your child's special education. You'll learn about key sections in the Individuals with Disabilities Education Act of 2004, what our child's test scores mean, and how to develop SMART IEPs. Either Pete or Pat will teach you how to prepare for meetings, the gentle art of disagreeing, and how to maintain healthy working relationships with the school. The texts for this programs are Wrightslaw: From Emotions to Advocacy, 2nd edition (Retail: $19.95) and Wrightslaw: All About IEPs (Retail $12.95). Presenter: Pat Howey, advocate and author of Ask the Advocate or Pete Wright, Esq. Two-day Special Education Law and Advocacy Boot Camps (12 hours) are more intensive and personalized. Participants have opportunities to network. In a Wrightslaw Boot Camp, you learn how to use special education statutes and regulations to get answers to your questions; to use tests and measurements to measure educational progress; chart out test scores; write SMART IEPs goals and objectives; learn how to use Every Student Succeeds Act (ESSA) as a tool to open doors to services, learn how to create paper trails; write effective letters, and use advocacy strategies to negotiate for appropriate special education programs. We limit the number of Boot Camps to two or three per year and one per region of the country. 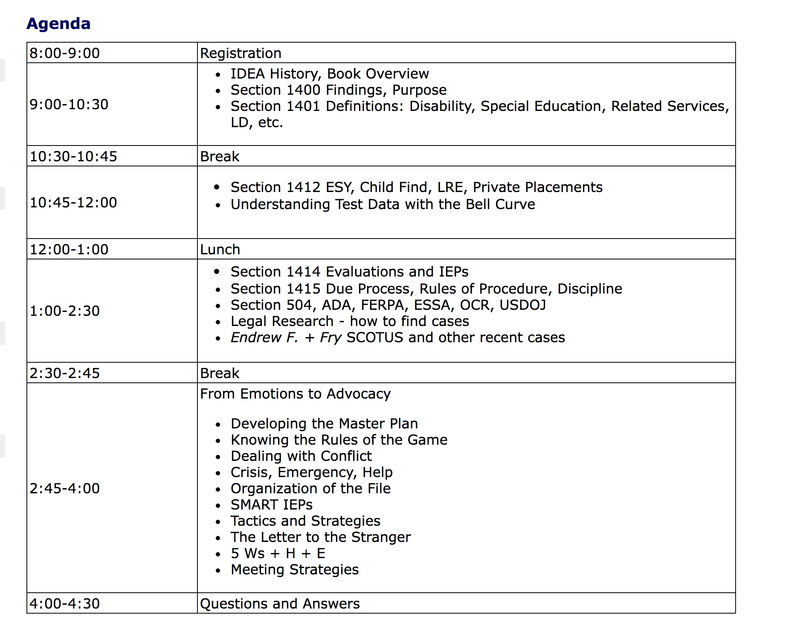 The registration fee includes the same books listed above in the one-day Special Education Law and Advocacy program. You Can't Go Wrong with Wrightslaw Training Programs!